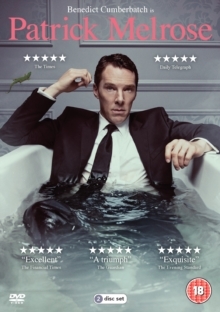 All five episodes from the British television drama miniseries in which wealthy upper-class Englishman Patrick Melrose (Benedict Cumberbatch) struggles to manage his drug addiction and memories of an abusive childhood. Growing up, Patrick suffered abuse at the hands of his father David (Hugo Weaving) and, with his mother Eleanor (Jennifer Jason Leigh) turning a blind eye, Patrick's life as an adult spirals out of control as his past experiences return to haunt him and he attempts to manage the torment by turning to drugs and alcohol. As the years pass by, Patrick continually attempts to overcome his dependencies by seeking help, only to return to them when sobriety forces him to face reality. The episodes are: 'Bad News', 'Never Mind', 'Some Hope', 'Mother's Milk' and 'At Last'.